If you’re wondering ‘what age should I start getting my puppy groomed,’ the following information should help you. First, congrats on the newest member of the family! Having a new puppy in the house is a wonderful time to explore a fun and engaging relationship. It’s not all laughs and giggles, though. To ensure your pup gets the right social behaviors in place, a bit of proactive training is required. This requires patience and positive reinforcement. This is especially true of professional services like grooming, pet-sitting, and visiting the vet. Whatever it is, it starts early. The first thing you should know about a puppy is that they remember their first experiences with things quite well. That being said, the first grooming experience will stay with them their whole life – positive or negative. The best way to ensure the first time is great for your pup is to begin touch training right away. Also, if you already know where you will get the grooming done, get a bottle of the pet shampoo they will use for scent conditioning. As soon as you get your pup, make sure you are petting and gently handling her all the time. Make sure to frequently touch paws, teeth, nails, ears, and inner thighs to condition your pup for all-around handling. You can also introduce water by a periodic shallow dip in the bottom of a bathtub (starting just above the paws, gradually deeper). If you already have some, let her smell the pet shampoo, and maybe even add a bit to her paws. Give them lots of positive and soothing language, a treat, and room to play a bit. 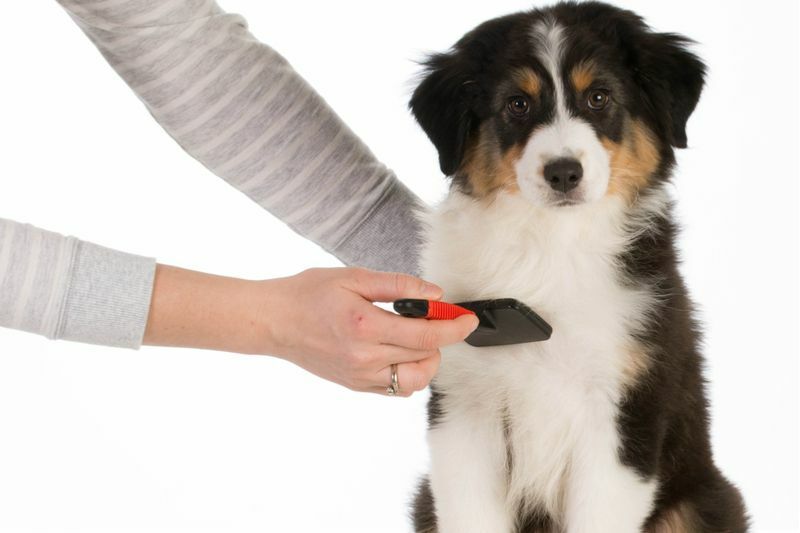 Once your pup is comfortable being handled, you can start brushing and combing. This gets them ready for the tools used during a grooming session. Once you’ve successfully acclimated your pup to all-around handling, at or around the 10-12 week mark, you can take her in for the first grooming session (often after the second round of shots). At the latest, the first grooming is recommended before 16-weeks of age. Making sure to pre-vet the salon you will hire to take care of your pups grooming needs is important. Doing a bit of research in advance can make all the difference. Do some online searches, read reviews, and go visit the few that rise to the top. When you know that the people grooming your pet have great reviews, use all-natural products, and treat pets with respect, your pup will have the best chance of experiencing a great grooming session – the first time, and every time. Now that you’ve done all the preliminary work, it’s time for the first grooming. To make sure your pet gets the best experience possible, let your groomer know everything you’ve noticed regarding any sensitive areas or places things she’s still working on. After the initial consultation, say a quick and happy goodbye and give her a treat. Your groomer is a trained professional and has chosen to groom because they truly love pets. If you’ve done your research, your pup is in great hands. You should now have your answer to your question ‘what age should I start getting my puppy groomed.’ With only a bit of preparation, your pup should have a great experience when they arrive for their first grooming session between 10 and 16 weeks of age. If you have more questions, please reach out to us at your earliest convenience. We love answering questions around all things puppies!